Powers/Abilities: Due to his Kree heritage, Marv-ell had twice the strength, endurance and stamina of an ordinary human. Trained as a warrior by his people, Marv-ell was seen wielding a green lightsaber. (Marvel Mangaverse#1 (fb) - BTS) - The Kree warrior Marv-ell was selected by his people to secretly guard Earth from the Skrull empire and their ultimate weapon of devastation, an anti-life virus called Galactus. This threat was created by tapping into the matter of Mephisto's planet, one of the twelve original lifebearing worlds of the universe. Galactus would soar across the universe to devour entire worlds and civilizations. (Marvel Mangaverse#3 (fb) - BTS) - Marv-ell was aided in his task by Computo, a sentient orb wich he could use to access information on his power and history of the Kree and other guardians. (Marvel Mangaverse#1 (fb) - BTS) - As time went on without any sign of Galactus, Marv-ell became part of Earth's society, met and fell in love with Alice who at the time was better known as Ms. Marvel, female world wrestling champion in 1989. Moving in together in Queens, New York Marv-ell and Alice had a son Marvin. 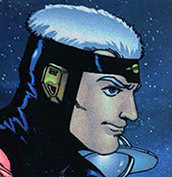 (Marvel Mangaverse#1 - BTS) - Marv-ell took on the human name Marty Ellwood. (Marvel Mangaverse#1 (fb) - BTS) - Marv-ell died when his son was six. He had left instructions, this was kept from Marvin, who was led to believe his father was on an extended European business trip. Marvin wouldn't learn of his true heritage until he was eighteen. By then, a specially prepared, sealed room in the house was waiting for him. Inside were several crates that included two of Marv-ell's old costumes and Computo, who was ready to assist Marvin. (Marvel Mangaverse#3 - BTS) - The ghost of Marv-ell appeared from Computo to empower his son with the spirit of the eternal Kree. Now a warrior of the Kree both in spirit and body, Marvin fought Kreega the Super Skrull on the surface of Galactus. Comments: Created by Ben Dunn. 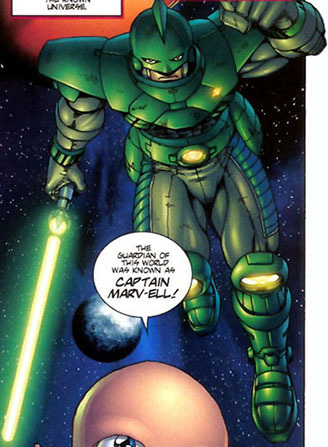 In the Mangaverse Captain Marvel was called Marv-ell unlike other realities where it's Mar-Vell. Speaking of names... Out of all the possible names a spaceman could give his son, Marv-ell picked Marvin? As in Marvin the Martian, of Looney Tunes fame? Due to the Asian specific nature of the Mangaverse reality, it goes without saying that while characters might look similar to their 616 counterparts, they most likely will have distinctly different names, codenames or powers. Therefore we will only list the names when they have been used in the comics.